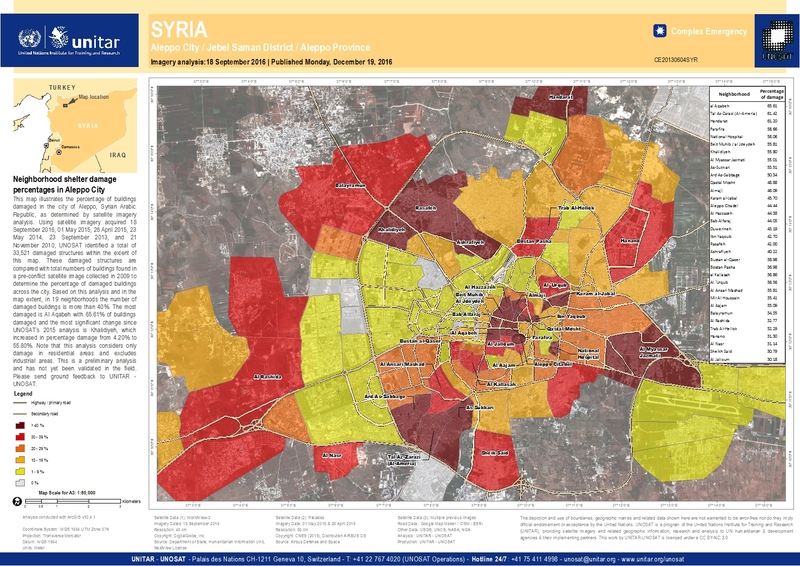 This map illustrates the percentage of buildings damaged in the city of Aleppo, Syrian Arabic Republic, as determined by satellite imagery analysis. Using satellite imagery acquired 18 September 2016, 01 May 2015, 26 April 2015, 23 May 2014, 23 September 2013, and 21 November 2010, UNOSAT identified a total of 33,521 damaged structures within the extent of this map. These damaged structures are compared with total numbers of buildings found in a pre-conflict satellite image collected in 2009 to determine the percentage of damaged buildings across the city. Based on this analysis and in the map extent, in 19 neighborhoods the number of damaged buildings is more than 40%. The most damaged is Al Aqabeh with 65.61% of buildings damaged and the most significant change since UNOSAT?s 2015 analysis is Khalidiyeh, which increased in percentage damage from 4.20% to 55.80%. Note that this analysis considers only damage in residential areas and excludes industrial areas. This is a preliminary analysis and has not yet been validated in the field. Please send ground feedback to UNITAR - UNOSAT.